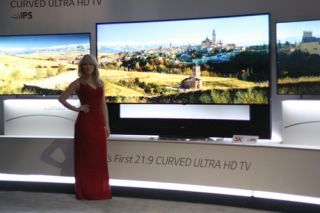 Best TVs of CES 2014: flexible, curved, 4K | What Hi-Fi? CES was once again dominated by TVs. While the television market may not be the most buoyant, TV manufacturers did their level best at CES 2014 to present a bright future for the rectangle in the corner of your living room. As the wider world of consumer technology takes up an increasingly larger space at CES, with wearables, in-car tech, tablets and a smattering of smartphones stealing attention, it's still the traditional consumer electronics companies that make the most noise. And they tend to do so by pushing the boundaries of TV innovation. The TV news from CES is a mixture of 'now' – the complete TV line-ups that will fill the shops on the high street – and 'next', which sees the big brands posturing with increasingly outlandish technolgies to see what sticks and simply get people talking about TVs. And it works. The craziest televisions on show were once again the main talking points, helping to drag the tech world's attention away from the now dominant smartphone and tablet markets for at least a week or so of the year. So, what did we learn from TVs at CES 2014? While HD, 3D and smart TV have been the stories in years gone past, 2014 was all about 4K TV. New ranges, bigger sizes and also cheaper Ultra HD TVs. But there was much more besides, with bendable TVs, 21:9 TVs, Android TVs and more. Here are the best TVs from CES 2014. Well, we didn't see this one coming. Flexible TVs that can bend at the touch of a button on your remote control were the surprise package at CES 2014. Why? Erm, we're not sure. We're only just getting our head around curved TVs, with the Samsung KE55S9C making some sense to us though still with limitations. Bendy? Now that's a whole new, hard-to-explain-the-point-of ball game. Still, they got people talking and certainly brought some wow factor. Samsung naturally showed a flexible TV, too, but it was the LG, which was an OLED set and flexed far more convincingly (the Samsung's frame stayed still while the screen moved) that impressed us most. We were lucky enough to get a behind closed doors briefing of the new Philips TVs, which are powered by Android, and we liked what we saw. They aim to marry the best of the existing smart TV apps with the huge wealth of apps and games offered by the Google Play store. Chinese manufacturers have offered similar Android TVs before but this is our first look at a big-name brand effort that's bound for the UK. Philips sets haven't exactly majored on 'smart' or come with particularly impressive interfaces, but these new sets looked a vast improvement. Picture performance, response times and the effectiveness of the remote control (which offered wireless gesture control) will be crucial. Expect to see the sets in the UK in Q2 2014. We thought we were having trouble getting over the end of Panasonic plasma TVs, but it seems Panasonic is similarly pining for the plasmas of old. Panasonic's flagship 2014 4K TV, the AX800 Series, is billed as offering "plasma-level picture quality using LED technology". Either way, and TV jargon aside, after the success of Panasonic TVs in our 2013 Awards, we can't wait to see these 2014 models in our test rooms. Sometimes you just have to step back and say, "Yep, that's pretty cool". And that's what we did with the monstrous Samsung 105in curved TV. Why is it curved? We're still not sure. Why the 21:9 aspect ratio? Who knows? Does it look jaw-droppingly amazing? Yes, yes it does. It may not be particularly real world for anyone other than a few Russian oligarchs but when it comes to making noise about TV and getting people excited about the future of television, this TV did the job. Sony is keeping it flat for 2014 when it comes to its TV screens, but there's a new "Wedge" design available on certain models, which again uses the Magnetic Fluid Speaker technology for better-quality sound. This year's wedge design means more room for the speaker drivers, so we're expecting good things – last year's Sony KD-65X9005A already delivered the best TV sound quality. All the new Sony TVs for 2014 feature HDMI 2.0 and connections and the new HEVC codec for playing potential new 4K streaming video feeds. There's a flagship 85in X95 TV but it's the 55in, 65in and 75in X9 TVs that we're most excited about from Sony. Most of the noise about TVs at CES 2014 centred around super-size, super-expensive TVs, but we're happy to report that not only were there plenty of more affordable TVs, there were cheap 4K TVs, too. If 4K is to go mainstream we need the content providers to deliver the goods, but we also need the technology to become more affordable. 4K sets from Kogan and Polaroid look set to come in under £1000 in 2014 and while we can't vouch for the quality, it's a sure sign that the technology is becoming more affordable. We must also raise a glass to absent friends: OLED and plasma TV. The latter was no great surprise. In fact, the surprise was that there were any plasmas at all on show, with LG revealing it will have four plasma ranges in 2014. As for OLED TV, its absence was more worrying. The technology's dismally low yield – 1 in 10 panels is not fit for use – doesn't seem to have been rectified, and the recent end to the Panasonic and Sony OLED partnership seems to point towards a real shift away from OLED to 4K as a focus. Again, the only flexible OLED set was from LG, which also announced two more curved OLED screens. Samsung remained tight-lipped about its plans for the technology, and we still haven't seen any flat OLED TVs other than the LG Gallery OLED TV. It looks like OLED TV has dropped down the priority list for now. Still hungry for more CES goodness?